My name is Michael Quinn Patton and I am an independent evaluation consultant based in Minnesota but working worldwide. In the last few months I have been editing a book on Developmental Evaluation Exemplars with Kate McKegg and Nan Wehipeihana. (The book will be out in September.) Tomorrow Kate will share what the Developmental Evaluation (DE) cases we’ve reviewed and analyzed reveal about readiness for DE. The following day Nan will share what we’ve learned about developmental evaluator roles and responsibilities. The rest of the week will include reflections from three more developmental evaluators. Today I’m going to introduce the principles of DE that have emerged from this collaborative work with DE practitioners. . Hot Tip: Understand the specific niche of DE. DE provides evaluative information and feedback to social innovators, and their funders and supporters, to inform adaptive development of change initiatives in complex dynamic environments. Hot Tip: The principles are inter-related and mutually reinforcing. The developmental purpose (#1) frames and focuses evaluation rigor (#2), just as rigor informs and sharpens understanding of what’s being developed. Being utilization-focused (#3) requires actively engaging with social innovators as primary intended users and staying attuned to the developmental purpose of the evaluation as the priority. The innovation niche of DE (#4) necessitates understanding the situation and what is developed through the lens of complexity (#5) which further requires understanding and applying systems thinking (#6) with timely feedback (#8). 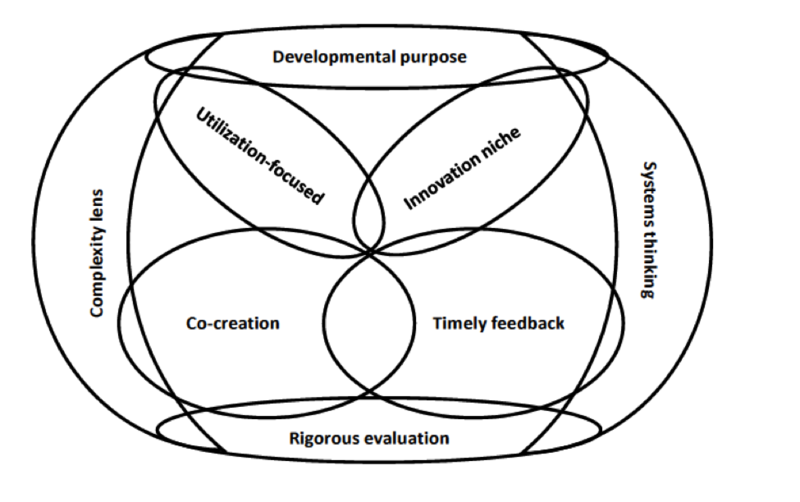 Utilization-focused engagement involves collaborative co-creation (#7) of both the innovation and the empirically-based evaluation, making the developmental evaluation part of the intervention. Cool Trick: Work with social innovators, funders, and others involved in social innovation and DE to determine how the principles apply to a particular developmental evaluation. This increases their relevance based on contextual sensitivity and adaptation, while illuminating the practical implications of applying guiding DE principles to all aspects of the evaluation. Developmental evaluation: Applying complexity concepts to enhance innovation and use by Michael Quinn Patton (Guilford Press, 2011). Thanks for the post. It provides a great starting point for Evaluators wanting to know more about Developmental Evaluation and get involved. Is there a relationship between Design Thinking and Agile Methodology and Developmental Evaluation? If so, what are the commonalities? I would also like to know if there is an evaluability assessment/preconditions required for Developmental Evaluation, or can a programme or intervention at any stage of its development/context engage in Developmental Evaluation? Thanks again for sharing. I look forward to your response.